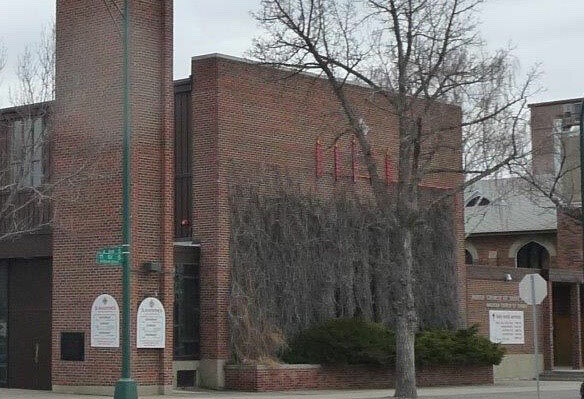 Later this fall St. Augustine's Church in Lethbridge will become significantly more accessible thanks to a redesign of the west entrance. 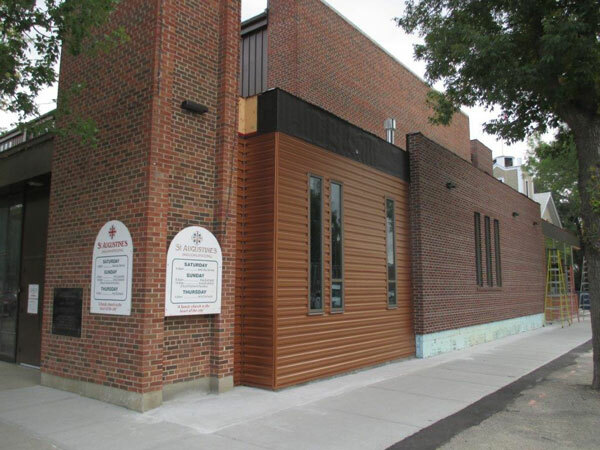 To accommodate the ramp access that the congregation identified in 2011 as the primary renovation need, the 2013 architectural design called for a new west wall to be built, using an extra two feet of sidewalk to be purchased from the City. With its new brickwork perfectly matching the old and its large windows onto the street, “the new wall is faithful to the original but softens its austere appearance,” explains Beth Songer, project architect and church member. The result will be not only easier access but also, with the expanded narthex, a far more attractive gathering place, joining the church and the hall together in a beautiful glassed-in entrance space. It will also mean that children going to their Sunday School classes will not have to go outside during the winter months. Stained glass windows from the former parish church of St. Mary-the-Virgin, which merged with St. Augustine’s in 2004 after 95 years of ministry to North Lethbridge, will also greatly enhance the beauty of the new church entrance, as will new landscaping of the central courtyard. The extra space at the west end will also enable the important addition of a prayer room, a quiet and private space for our weekly offering of the ministry of personal prayer following worship services. Ramp access into the building will help to reduce the challenge of seven different levels in the church. Further help will come from new elevator access to the currently under-utilized balcony and the heavily utilized crypt. As long as twenty years ago less mobile church members had wished they could participate in activities in the crypt without having to negotiate the stairs. The crypt plays a central part in the life of the church, being used among many other things for the coffee hour held after the 10 a.m. service. Fellowship at St. Augustine’s is unthinkable without this weekly time of refreshments and fellowship. The addition of an accessible washroom and renovations to the kitchen and nursery will complete our new barrier-free crypt. The primary reason for our renovation is to make St. Augustine’s accessible to all. Such a goal is consistent with our call to embody something of the hospitality and welcome of our Lord Jesus Christ who invites everyone into a living relationship with him and his people.